Through the Ashes of Empires is the fifth studio album by Machine Head. 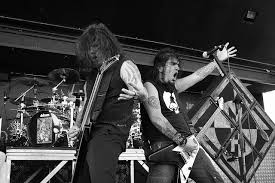 It was written during a turbulent time for the band after they appeared on the metal scene with the immensely popular debut album, Burn My Eyes and then followed that up with The More Things Change album which, in my opinion, is even better than their debut release. 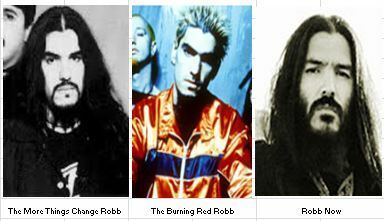 The next two albums, The Burning Red and Supercharger, heralded a change of direction for the band though with image and musical style encompassing a more “nu – metal” style with the inclusion of rap lyrics and the removal of most guitar solos. After such a heavy and impressive debut and follow up, the change was a bit much for a lot of fans too handle. The bands sales dropped dramatically culminating in them parting ways with Roadrunner Records after funding was cut and in the departure of current guitarist, Ahrue Luster. Now, I should just quickly point out that despite the negativity surrounding the time of The Burning Red and Supercharger, musically both albums were not exactly terrible. They were different, maybe too different, but both albums contain a decent selection of very good songs (The Blood, The Sweat, The Tears, Five, The Burning Red, Bulldozer, Crashing Around You and The Deafening Silence to name a few) and the live show, including the playing of songs from these albums, was still very much Machine Head at its loudest and heaviest. Now with three members, Adam Duce, Dave McClain and Robb Flynn only full time in the band and Vio-Lence founder and guitarist, Phil Demmel as temporary cover for Ahrue, Machine Head, without a record label started work on the new album, Through the Ashes of Empires. With Phil covering the lead guitar recording duty before becoming a full time member just before the album release, little did we know that Machine Head were about to fulfil the expectations everyone had in them when the debuted. The 10 track album kicks off in quite spectacular fashion with what is probably Machine Head’s heaviest track to date, Imperium which builds gently with a nice clean chord and then a layer of clean guitar on top of that before exploding with drums to let you know within 60 seconds of the first track that this is not going to be “nu-metal”. Imperium is followed by more powerful drumming and catchy rhythm on Bite the Bullet and then by the emotionally charged and extremely angry Left Unfinished, with furious lyrics focused on bad parenting. Elegy showcases just how tight the band have become and is slightly less aggressive then the first three tracks, slightly, and is followed by the excellent In the Presence of My Enemies and then yet another real treat in Days Turn Blue To Gray which has a genuinely mature sound with some great slow singing vocals as well as Robb’s more powerful growls and many changes in tempo. It is a real pleasure to listen to. The album continues to hit home with more heavy tracks in Vim, the tempo changing All Falls Down, again showcasing Robb singing softly as well as angrily amidst slowdowns and speed ups, and Wipe the Tears which actually carefully implements the better elements of their previous two albums into it. Then we come to the final song, Descend the Shades of Night, which can only be described as Epic! Machine Head like you have never heard them before with a soft melodic acoustic intro which continues on into the verse, clever touches like the background drumming at the start of the still acoustic second verse before the drums kick in. While the tempo is still slow, the volume raises a level and you can feel the raw emotion pouring out of your speakers. This song also contains Machine Head’s best guitar solo up to that point in their history with Phil and Robb working off each other beautifully and showing us what was to come in the future before the songs starts to end with Robb screaming “Free Me” just before one final chorus of this almost 8 minute long musical masterpiece. This album is 10 years old on the 16th December 2013 but listen to it now, and it sounds as up to date as anything coming out right now. It is a phenomenal album. Dripping with emotion and showing real character for the band, after everything that had happened that rather than quit, to put their heads down, work hard and start again. It worked, this was the best Machine Head album to be released up to that time and things were only going to get better. A masterpiece.